There are several foods which are traditionally Irish or Irish American -- Corned Beef and Cabbage, Ham or Irish Bacon and Cabbage, Irish Stew, and Shepherd's Pie. And, of course, Irish Coffee. But certainly one of the most famous and popular foods is Irish Soda Bread. It is inexpensive to assemble, quick and easy to make, fairly nutritious and filling, and tastes great. Related to this is the Spotted Dog which is Irish Soda Bread with raisins and Sultanas (a type of golden raisins) or Currants and sometimes made with whole wheat flour. The history of the bread goes back to the 1800s with references in various books and journals. 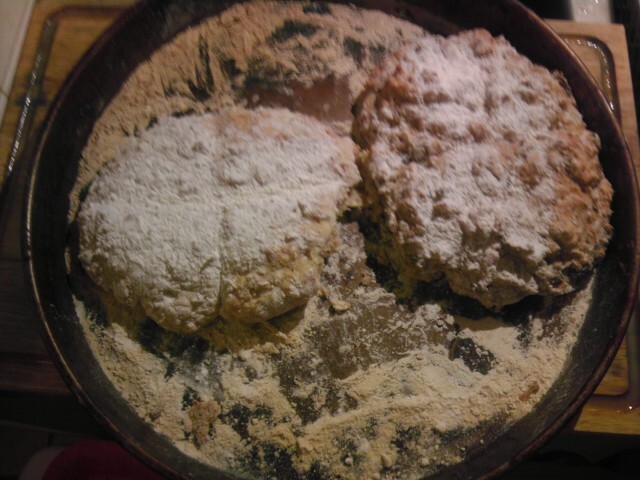 However, the process to make soda bread might originate centuries ago with the Native Americans. See history of soda bread at the website for The Society for the Preservation of Irish Soda Bread. In addition to flour, the key element in the bread is a leavening agent -- something to make it rise. Unlike soda bread, most breads use yeast which leavens or rises the moistened flour into soft bread. 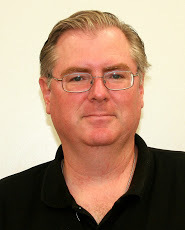 But Irish Soda Bread uses a chemical reaction of a base plus an acid which releases carbon dioxide gas bubbles which causes the bread to rise. There are today many possible recipes for Irish Soda Bread, and a quick search of the internet or an Irish cookbook will show various possibilities. Traditionally, however, Irish Soda Bread had just four ingredients -- flour (usually from soft wheat), salt, baking soda (bicarbonate of soda), and buttermilk. Sour milk might have been used in place of buttermilk too. Native Americans would have used the ashes from a burned plant or vegetable as a type of base or potash. When the base potash was mixed with the lactic acid in the buttermilk or sour milk, the chemical reaction released a gas or very small bubbles which caused the flour to rise when baked. The Society for the Preservation of Irish Soda Bread has a fascinating, in depth article on the history of Irish Soda Bread. See Soda Bread. In it, it states that in 1861 in a Dublin based academic journal called “Chemistry and Chemical Analysis” published by the Ireland Commissioners of National Education that soda bread became popular due to difficulties in obtaining yeast. It says that carbonic acid was the key factor, obtained from bicarbonate of soda. 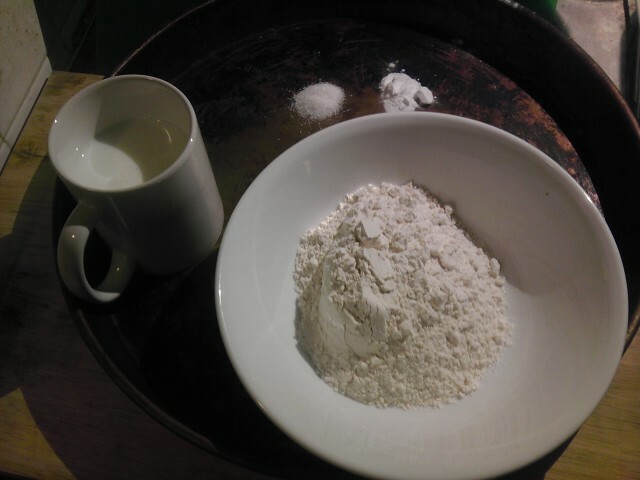 When mixed with flour and sour milk, which is an acid, the mixture will rise when baked. The website for The Society for the Preservation of Irish Soda Bread also states that in 1850 there was an article in the Dublin Quarterly Journal of Medical Science which discussed, of all things, Soda Bread. It stated that during the Irish Potato Famine bicarbonate of soda became popular with people to make bread from flour without yeast. Of course, it must be added that soda bread was not a solution in any way to the famine. Most of the Irish people did not have access to wheat flour at all, much less to flour leavened by baking soda and buttermilk. 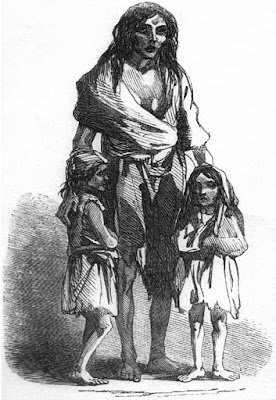 The Irish were starving to death with no food source at all; all the food which was plentiful in Ireland, including wheat, was controlled by the British. 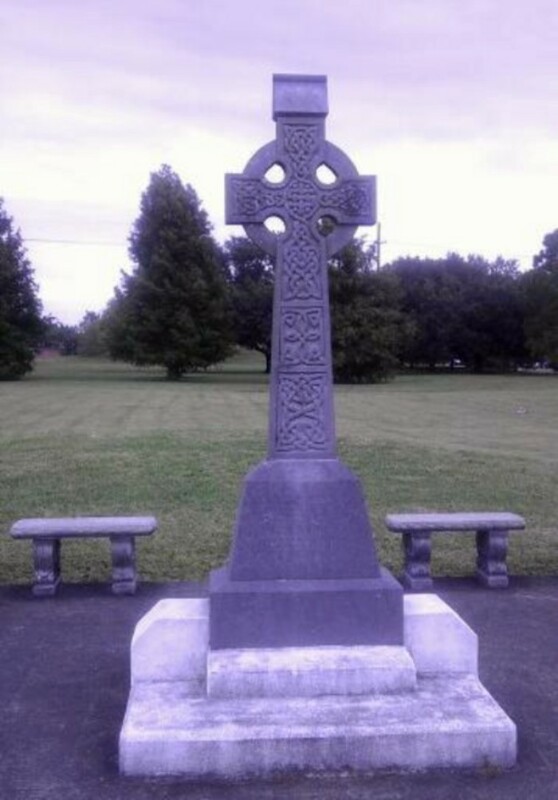 Much of it was exported for profit, while the Irish starved or emigrated mainly to America. The famine was not merely the result of rotten potatoes but of centuries of British oppression in Ireland which left the Irish populace largely dependent upon one source of food -- potatoes. To read more about this topic, see my earlier article on Coffin Ships and the Potato Famine. So, soda bread probably originated in America with American Indians and then was acquired by European settlers, was brought to Europe by the British, but was used mainly by the Irish. The Irish Food Board called Bord Bia, a government agency in Ireland that deals with food and agriculture and is much like the Department of Agriculture in the USA, gives its own recipe for Irish Soda Bread. See bread. It uses flour, buttermilk, salt, and soda as in the traditional recipe; but it also adds an egg, margarine, and cream of tartar. 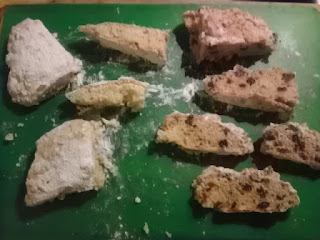 I made my own Irish Soda Bread and Spotted Dog and included some photographs. I will not give the exact recipe because I think people can experiment with it and find what they like best. But in general for the basic soda bread, I used the traditional four ingredients -- all purpose white flour, sea salt, baking soda (not baking powder), and buttermilk. Use about one cup of flour to a half teaspoon of salt and a half teaspoon of baking soda. Moisten the mix with buttermilk until thick and gooey. Bake for about a half hour or more around 350 to 400 degrees. 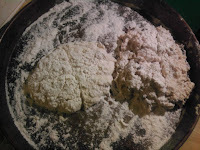 Traditionally, a cross is cut with a knife in the top of the powdered, round loaf before putting into the oven. It is said this releases angels, wards away evil, or has a religious significance. The Spotted Dog I made the same way except I added some whole wheat flour and a bit more sea salt and lots and lots of raisins. Bake it, slice it, and top with butter and honey or jam. In Ireland they would serve Irish Soda Bread with tea, probably. But I prefer coffee. Bord Bia, Irish Food Board website at http://www.bordbia.ie/consumer/recipes/desserts/Pages/TraditionalWhitesodaBread.aspx; The Society for the Preservation of Irish Soda Bread at http://www.sodabread.info/ and their history page at http://www.sodabread.info/history/ ; Wikipedia article on Soda Bread at https://en.wikipedia.org/wiki/Soda_bread; Irish Cooking by Ruth Bauder Kershner Weathervane Books, 1979, (Ottenheimer Publications, Inc). All photos in this article are by Adrian McGrath.